the walled-in city became the creative melting pot for sub- and pop-culture. Before the iron curtain fell, everything and anything seemed possible. 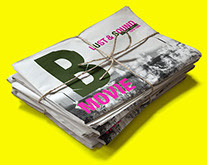 B-MOVIE is a fast-paced collage of mostly unreleased film and TV footage from a frenzied but creative decade, starting with punk and ending with the Love Parade, in a city where the days are short and the nights are endless. Where it was not about long-term success, but about living for the moment – the here and now.